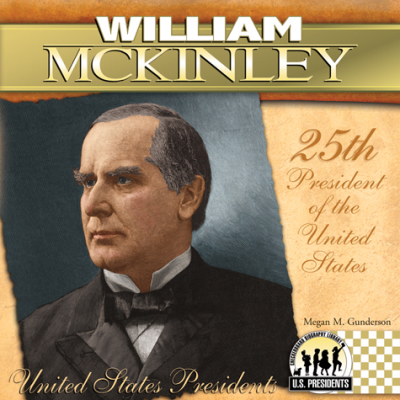 William McKinley was the 25th President of the United States, serving from March 4, 1897, until his assassination in September 1901, six months into his second term. 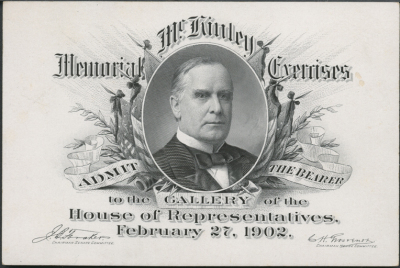 William McKinley served in the U.S. Congress and as governor of Ohio before running for the presidency in 1896. 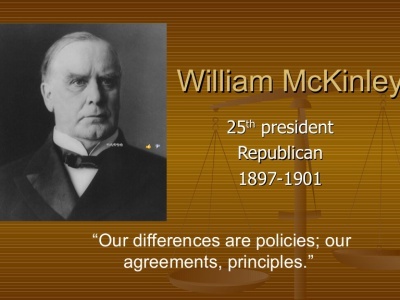 As a longtime champion of protective tariffs, the Republican McKinley ran on a platform of promoting American prosperity and won a landslide victory over Democrat William Jennings Bryan to become the 25th president of the United States. 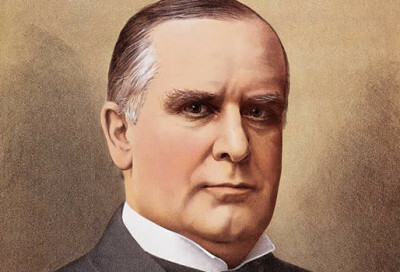 In 1898, McKinley led the nation to war with Spain over the issue of Cuban independence; the brief and decisive conflict ended with the U.S. in possession of Puerto Rico, the Philippines, and Guam. In general, McKinley’s bold foreign policy opened the doors for the United States to play an increasingly active role in world affairs. 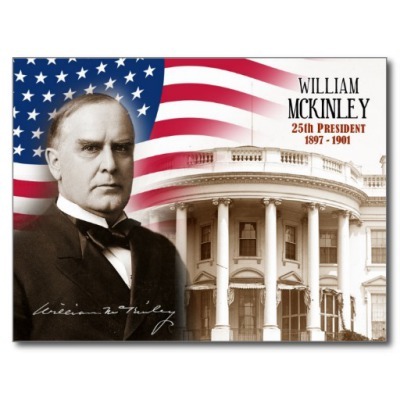 Reelected in 1900, McKinley was assassinated by a deranged anarchist in Buffalo, New York, in September 1901. McKinley’s administration also pursued an influential “Open Door” policy aimed at supporting American commercial interests in China and ensuring a strong U.S. position in world markets. In 1900, McKinley backed up this policy by sending American troops to help put down the Boxer Rebellion, a nationalist uprising against foreign intervention in China. The following day, McKinley was standing in a receiving line at the exposition when an unemployed Detroit mill worker named Leon Czolgosz shot him twice in the chest at point-blank range. (Czolgosz, an anarchist, later admitted to the shooting and claimed to have killed the president because he was the “enemy of the people.” He was executed in October 1901.) Rushed to a Buffalo hospital, McKinley initially received a hopeful prognosis, but gangrene set in around his wounds and he died eight days later. Vice President Theodore Roosevelt succeeded him.